Workshops are fun! | Quirks Ltd.
One of the best things about our guild is the workshops we offer. Every other month, two workshops and a lecture by professionals! 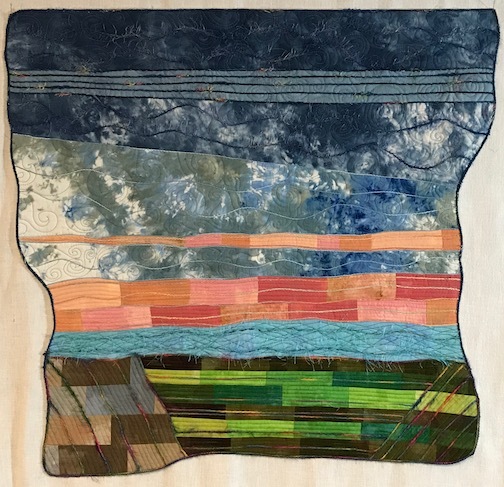 You can find out all about it here–Greater Ann Arbor Quilt Guild. Anyhow, I took Freida Anderson’s Whispering Pines class and it was like a mini-vacation for me. No sewing, so no heavy machine to haul. Made from a kit, so no wondering whether or not I was bringing the correct fabrics. Working from a pattern, but lots of improv within the design, so that was very appealing to me. This is what I have so far. I want to add some little details here and there. My trees are not like Freida’s. Hers are all nicely lined up, with soft, rounded edges, perfectly color gradation matched and look great. Mine are square-edged, uneven, don’t all match and look pretty good, too, if I do say so myself! However, I was not the only one who went all “rebel” in the tree area. I only got a couple of pictures, but there were tulips and wild trees and I think a few things never seen in real life! Of course there were those who made beautiful trees, much more like Freida’s, but we all just had such a good, relaxing day that the project was almost an afterthought. Love having good times with fabric! Art Quilts, Color, Contemporary, Learning New Things! ← My heart options are done! Yours look more like feathers. Love them!! If I’d have looked around a bit more before I did them, I might have gone even further afield! It was a good time!!! Wish I’d have taken the time to get a photo of all the rebels! Please bring it to next quilt day so I can see your fabulous finish!!!! My kind of class. I would love to take it myself. It is too bad that our guild sticks with the more traditional stuff. Not many classes for contemporary quilts. We try to mix it up, but we have a guild that is about an equal mix of art and traditional quilters. Your project appeals to me so much more than the kit version…..as do the others you shared…..looks like you all had great fun. Still a kit, but a gorgeous fabric kit and we all certainly did have a good time!